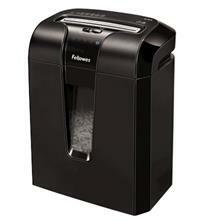 Shredding up to 10 sheets at a time, the Fellowes Powershred 63Cb Cross-Cut Shredder is suitable for personal use in either the home or small office. The shredder shreds paper into 4x50mm cross-cut particles which gives it a P-3 security level rating (suitable for confidential shredding). The waste bin is 19 litres and simply pulls out when you want to empty it. It also has a see-through window so you know when it is getting full. There’s no need to bother removing staples or paperclips from your documents before shredding as the Fellowes 63Cb will handle these too - and credit cards can also be shredded as well. This stylish shredder comes with a number of handy features including: Jam Blocker which aims to stop paper jams before they start (a remove paper icon will illuminate on the shredder if it senses too much paper has been loaded and you can then reduce the paper quantity accordingly); SafeSense Technology which stops the shredder immediately if hands touch the paper opening; an Energy Savings System whereby the shredder will go into Sleep Mode after 2 minutes of inactivity; overheat and bin open indicators; a reverse option; and 230mm throat width. The shredder will shred for up to 8 minutes continuously before it requires a 20-minute cool down period, so it is great for medium usage shredding requirements. Warranty on the Fellowes Powershred 63Cb Cross-Cut Shredder is 2 years for the machine and 5 years for the cutting blades.